Not surprisingly, tooth discoloration is a common complaint in our telegenic world. A whiter, brighter smile is attractive and makes us feel more confident. However, not all stains are the same and, just like the laundry, understanding what causes tooth discoloration is important in treating it. Though you may have difficulty figuring out the stains on your teeth, a cosmetic dentist can usually identify the cause simply by looking in your mouth. A cosmetic dentist also understands the best treatments for stains or, in cases where stains are permanent, how to camouflage discoloration. Dr. Michael Bixby is highly trained in cosmetic dentistry and offers comprehensive care in the Red Bank, NJ, area. He can recommend treatments to overcome your tooth discoloration, from teeth whitening to porcelain veneers. Stains are grouped into two categories. “Extrinsic” or “outer” stains are those that affect a tooth’s outer enamel. A more stubborn group of stains is the “intrinsic” or inner stains, which affect the dentin core and cause discoloration deep inside the tooth. Extrinsic stains that affect the tooth’s enamel are usually caused by food and drink that discolors the enamel or plaque attached to it. This includes berries, tomato sauces, coffee, tea, and wine. But, don’t worry; you won’t need to forgo favorite foods to keep your teeth white. Thorough brushing and flossing on a regular basis keeps these stains at bay. And, should plaque on your teeth discolor, a professional dental cleaning should remove the plaque and discoloration at the same time. Surface stains can also be caused by tobacco and plaque, both of which can yellow teeth. Intrinsic stains that occur deep in the interior of a tooth are typically not a result of daily activities. Intrinsic discoloration can be caused by medications, chemicals, or a one-time event, such as trauma. Medications. Antibiotics such as tetracycline can discolor teeth if given to a child or if the mother was given the medication while she was pregnant. Other drugs can also stain teeth. Dental Fluorosis. Excessive fluoride can leave white spots or lines on teeth. Trauma. Chipped or broken teeth can darken when the interior nerve dies. Decay. Tooth decay can cause brown or black spots on teeth. Treating extrinsic, surface stains may only require a trip to the dentist for a professional cleaning. If the stains have sunk into the enamel, then teeth whitening may be in order. Unfortunately, intrinsic stains are more difficult to overcome and treatment will depend on the cause. For example, if a tooth darkened due to damage in the root, a dentist may be able to bleach the interior of the tooth. However, many intrinsic stains cannot be removed and will require a cosmetic treatment to conceal the discoloration, such as bonding or porcelain veneers. If you are concerned about tooth discoloration, particularly if a tooth has suddenly changed color without a logical explanation, then please call our offices for a consultation. 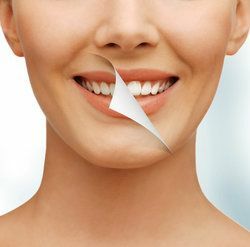 We can determine if there is an underlying cause that needs treatment or if the discoloration is staining that can be removed with a professional cleaning or tooth whitening.